On Saturday 3rd August I was 40 weeks and 4 days pregnant and we had planned a nice family day out – lunch and then exploring the local Maize Maze. When I got up that morning and realised I was starting to have a show, DaddyNatal Dean and I were cautiously excited… we knew there were no guarantees, but based on my previous two labours, this would suggest that birth would happen within the next 48 hours! We got ready and went out for the day – while taking the kids to the loo at lunchtime I caught sight of my bump in the mirror and took a photo as it looked HUGE! Unbeknown to me, this would be my last bump photo for this pregnancy. We had a lovely day out, no real ‘twinges’, but within minutes of getting into the car I felt contractions start up, low down and quite uncomfortable. This was nothing to get particularly excited about, as I always got contractions when we went out in the car, but towards the end of our journey home these were roughly coming 4-5 minutes apart with an accompanying suspicious lower backache!. We got home at about 6pm, I sat rocking and bouncing on my birth ball in the living room with Dean & the children as the contractions continued. At about 6.45pm I suddenly felt damp and found that I was losing more of the plug – at this point I think we both knew it was happening! Dean stepped into gear getting the children ready for bed and at 7pm took them up. I channel hopped to find something to watch on TV, and found a film to put on. When Dean had put the kids to bed, he came down and massaged my back while I kept rocking on my birth ball and breathing. By about 9.45pm, I instinctively felt it was now time to move into my birthing environment. Dean had gotten the candles lit in the room & turned the lights down, and the pool was ready for me to get in. Our special birthing playlist was playing (a mix of sentimental songs from our wedding and other occasions) and I decided that I wanted to start off resting on the beanbags. My aim was to keep comfortable but stay out the pool for a while longer as I didn’t want to get in too early and slow things down. At about 10.30pm I decided to get in the pool because at this point while the contractions were manageable, albeit fairly strong, the pelvic girdle pain I had suffered during pregnancy was making getting into any comfortable position on ‘dry land’ very difficult. Instinctively I felt I was now probably about 5-6cm dilated, so I expected getting into the pool would accelerate things, as it had done in my previous labours. Getting into the pool was lovely, immediately my pelvis felt soothed and I could move around! I took a kneeling position, leaning onto the side of the pool. As expected, within minutes of getting into the pool my contractions were suddenly much stronger, and I was humming through them (a technique that always works so well for me in labour!). We hope that the midwife who attends in labour will remain in the background, taking observations to check on mum and baby’s safety, but otherwise not getting actively involved in labour, unless requested otherwise. We believe that we know how to birth, but appreciate the security of having a midwife there to help with the unexpected or emergency situations. If possible, Steph would like to catch her own baby as he is born. If she is unable to do this on the day, we would like Dean catch baby and pass him to Steph. I remember Alison coming into the birth room and waiting until my current contraction had finished to just gently let me know that she was there. With my permission, she checked my temp, pulse and baby’s heartbeat very quickly and without interrupting the flow of things at all. She then left the room and gave Dean and I some privacy, just sitting in the hall outside the room, writing up her notes and ‘observing progress with her ears’ as she put it! The contractions were very strong now and taking all my focus. I knew at this point I was probably about 8-9cm dilated as I could feel the incredibly intense sensation of pressure down below as my waters were bulging out with every contraction. At about 12.40am, during one strong contraction, I could really feel the bag of waters ballooning down below, and I knew it was about to happen just before it did…. I felt them pop. The relief was immediate, the contraction just eased away, and I told Dean they had released. Dean used the torch to check the pool to see if they were clear. He popped his head out of the roon to tell Alison they had released, and also let her know that based on previous labours, the fact my waters had gone meant that birth would probably happen very soon. I was aware that Alison came back in with Dean to also check the waters, and heard her whisper her agreement that they were ‘crystal clear’. She went back into the hall and phoned the second midwife on call. I think at this point we all knew the second midwife wouldn’t be getting there in time! Just a short time later, about 1am, as a contraction came again, it felt different. I could suddenly feel the pressure of baby’s head and the unmistakable sensation of him moving down and knew that the second stage had started. At this point my body did something it had not done in previous labours, I felt it powerfully start moving baby downwards. This was completely uncontrollable, and it was an incredibly powerful sensation! At this point I was really groaning with every contraction as my body put all its efforts into birthing. It was amazing having this sensation as I felt how effectively my body was moving baby down with each contraction. All I could do was relax and let my body work. At this point in my previous two births, I had experienced no urges at this point, couldn’t feel my contractions during the second stage, and was coached to ‘push’ my babies out. I believe that the difference in environment this time around really made a difference, and this time I experienced the Fetal Ejection Reflex in all its glory! I could feel my body literally opening and his head descending, a feeling of pressure in my bottom got stronger and stronger as he moved down, then suddenly the pressure moved and wasn’t in my bottom but was now ‘down there’, and I knew he was very close to birth now. I reached my hand down to see if I could feel him and could feel a small section of the top of his scalp. Another contraction came and I could feel myself stretching, as it eased away I again felt down, and again I could feel his scalp – but much more of it now. I heard the midwife whisper to Dean ‘his head is right there’ but during the whole of the second stage this was all I heard, there was no coaching to push or to change position, we had a lovely quiet, calm environment where I was empowered to do whatever felt right. I just knew that his head was going to come out in the next contraction, and as it started I instinctively changed position from leaning forwards into more of an all-fours position in the pool, and roared as I felt his head pop out! It was 1.06am. I leant against the side of the pool, still in an all-fours position and just rested. There was a two minute break here, and although I didn’t know this at the time (I was truly in my own little world at this point!) Dean and Alison were behind me with the torch shining in the water watching baby’s head as during this ‘rest’ he gently rotated around, getting into position ready to birth the shoulders through the pelvis. As the next contraction started, I felt the pressure of baby’s shoulder start to be born and completely instinctively suddenly shot into an upright position (this was so fast/sudden, it was much to the surprise of Alison and Dean! But in retrospect this fits in with the spontaneous birth reflex I was experiencing) and felt him slip out. I looked down into the water and couldn’t see him (the room was only lit with candlelight!) and as I put my hands into the water to find him I was saying ‘Where is he? I’ve lost him! Where has he gone? !’ The light of the torch showed where he was and I picked him up and lifted him out of the water. I remember thinking how slippery he was as I lifted him up, it felt like he was a bar of soap! He still had a thick coating of vernix, which was literally falling off him as I lifted him out of the water. I couldn’t bring him very high as there wasn’t much cord length, which was when we saw he had his cord wrapped around his neck. Dean unwrapped the cord and then I could give him a big cuddle! We took some time to just be with him, the quiet birth environment still being maintained. After about 20 minutes Alison asked whether we wanted to leave the cord for longer or clamp it now – I had completely forgotten about it! It was clamped and Dean cut it. Proud big brother and sister! It was fantastic to just be able to go and sit on my own sofa afterwards, having cuddles with our son, while enjoying tea and biscuits. The post birth highlight was definitely at about 5am, we had gone to bed but the newborn cries had awoken our other two children and we looked up to see their little silhouettes silently peering around our bedroom door. Being able to beckon them in and introduce them to their little brother in this way was such a memorable moment and made giving birth at home even more special. 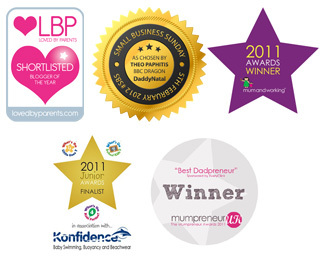 Steph is co-founder of antenatal & parenting programmes BabyNatal and DaddyNatal, alongside her husband Dean. This entry was posted in Uncategorized and tagged babynatal, birth, birth ball, birth environment, birth plan, birth pool, birth story, DaddyNatal, Fetal Ejection Reflex, home birth, MummyNatal, natural birth, Odent, positive birth story, spontaneous birth reflex, water birth by Steph. Bookmark the permalink. What a gorgeous fantastic natural way to birth your baby Steph thank you for sharing it with us it made me feel really emotional. Wow what an amazing birth story steph! A dream come true for you I’m sure. You sound like supermum! Enjoy the new born stage with your little bundle. Hope to see you at some point in the future. Lovely Lovely story. Congratulations!! Brings all the memories back from Koreys birth 4 months ago… I too would do it again tomorrow! Especially after reading that! Such an amazing feeling.